What a treat it was to spend some time with this mama and her two sweet babes. Real Postpartum is an opportunity to preserve a glimpse into the intimate bond you share with your child. Breastfeeding is often such a big part of my birth clients’ lives and it was a natural progression for me to exploring it through photography. Real Postpartum is also an opportunity share your experience, normalize breastfeeding, and to help other women feel more confident about breastfeeding (representation matters!). Nurturing a baby creates such a unique bond between mother and child and it's a fleeting phase that soon flies by. 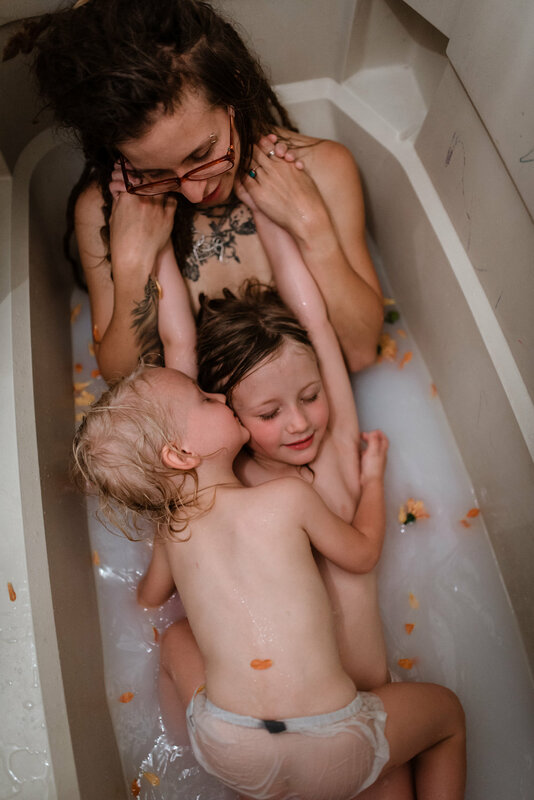 Book a Real Postpartum Session to capture one of the many magical, sometimes mundane, and treasured moments of motherhood. Real Postpartum encapsulates love and motherhood in all the little details you’ll want to remember. But more importantly, it stands for strength and perseverance through challenges. Late nights, long days, rediscovery: the connection and love present is powerful, sometimes raw, and absolutely beautiful. These moments are how you spend your days and nights — the real story — and they’re ones you'll wish you had images of outside of your own mind. Memories fade as time passes. A glimpse down memory lane with the help of photographs easily brings back the emotions of the time. Preserve a bit of your relationship with your baby with a Real Postpartum session. This is an opportunity to practice authentic self-love. To honor your body exactly as it is -- swollen, naked and milk-stained; you're exhausted and thrilled and oh so in love. Feeling the hazy daze of new parenthood, no longer pregnant, learning and healing and growing; you're changed and on the cusp of something new. Contact me for more information or to book your session today!